Scenic & Peaceful...a great hideaway...retreat, rejuvenate, relax! From south in Wenona looking north towards Dames Quarter, a scenic view at some of the best fishing, boating and birdwatching living on the East Coast. Welcome to Deal Island, Maryland! Deal Island is one of the last Bay type water and land mosaics on the East Coast left unblemished and untouched by the sprawl of modernism. 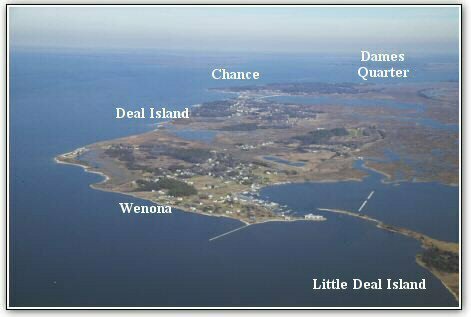 Deal Island, Maryland - 6 mile long, 3 mile wide neck of small town living surrounded by the Chesapeake Bay and tributaries in Somerset County of Maryland's eastern shore. If you are looking to vacation in a relaxed and rural setting, see our vacation rentals section.